Our Rydberg equation calculator is a tool which helps you compute and understand the hydrogen emission spectrum. You can use our calculator for other chemical elements too, provided they have only one electron (so-called hydrogen-like atom, e.g., He⁺, Li²⁺ or Be³⁺). Read on to learn more about different spectral lines series found in hydrogen and about a technique which makes use of the emission spectrum. In the below text you will also find out what Rydberg formula is. Check our hydrogen energy levels calculator if you want to compute the exact energy levels of a hydrogen-like atom. Humphreys series, when an electron goes from n ≥ 7 to n = 6 energy level. R is the Rydberg constant for hydrogen R ≈ 1.0973 * 10^7 1/m. In the advanced mode of our Rydberg equation calculator, you can compute the frequency and energy of the emitted electromagnetic wave. If you want to know how to convert wavelength to energy or frequency, check our photon energy calculator. emission spectroscopy in which we measure the energy of photons released by the material. Emission can also be induced by other sources, e.g., flames, sparks or electromagnetic wave. Our Rydberg equation calculator is dedicated to this type of spectroscopy. absorption spectroscopy occurs when we pass photons through the material and observe which photons energies were absorbed. reflection spectroscopy in which we determine how incident photons are reflected or scattered by the material. 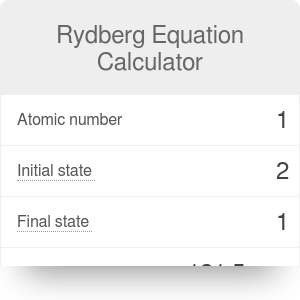 Rydberg Equation Calculator can be embedded on your website to enrich the content you wrote and make it easier for your visitors to understand your message.